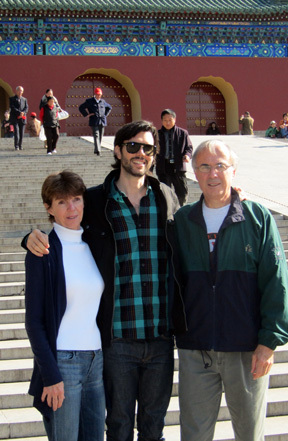 From the day we found out we were expecting little Olive Bee, we joked about how one day she would reach an age when telling people that she was born in Beijing, China would seem like bragging rights. 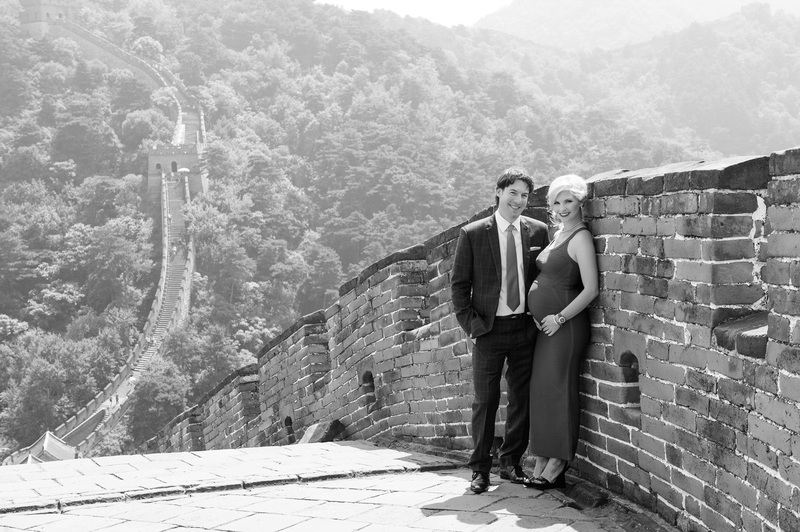 Well…since we stripped her of that joy – we thought the least we could do was take photos of her in utero on The Great Wall of China. A big thank you to photographer Diego Ferrini and to make-up artist Meili Autumn. Photography by Diego Ferrini. Make-up by Meili Autumn. 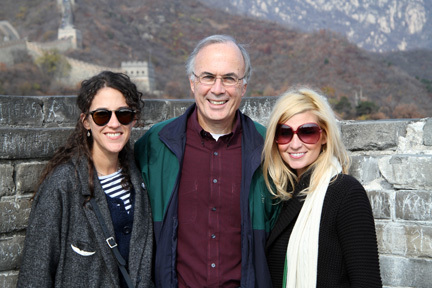 Please stayed tuned for A Blonde in Beijing’s big blog move….coming soon! All images courtesy of Diego Ferrini. Better Late Than Never, Right? 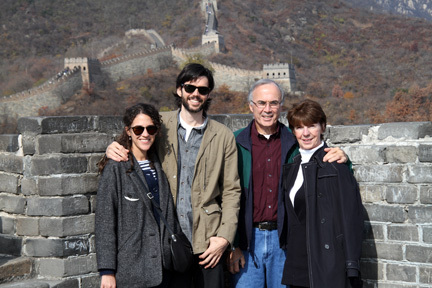 Here is a very tardy post of our wonderful visit with the Hutchinsons last November. 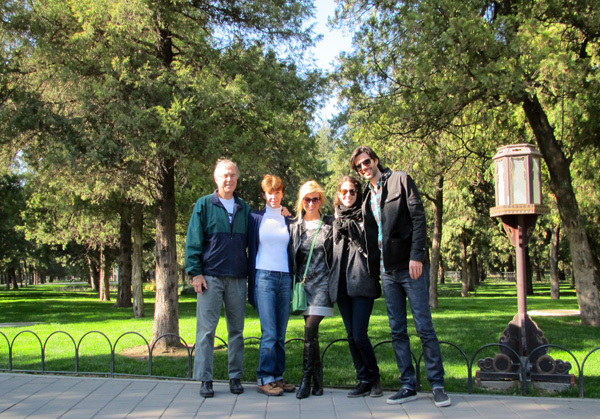 What a treat it was to be able to spend time with Brett’s parents, his brother Cory, and beautiful Kara here in Beijing. There are just some things that cannot be expressed through words or photos – which is why we love visitors. It actually enables us to really show what our life is like in this crazy, polluted, overcrowded…but still pretty fascinating foreign land. Unfortunately, their visit fell on an extremely busy week for Brett (which I think the majority of you, through deductive reasoning, will be able to tell by the absence of him in the photos below) which left us all missing him and forced the Hutchinsons to see China through the eyes of a Blonde in Beijing. I am hopeful that a good time was still had by all! 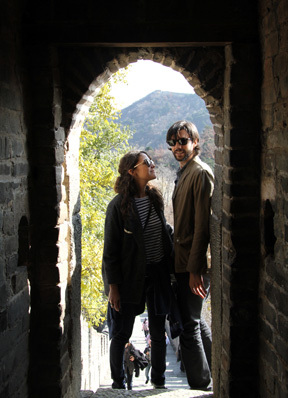 Kara & Cory – The Great Wall. 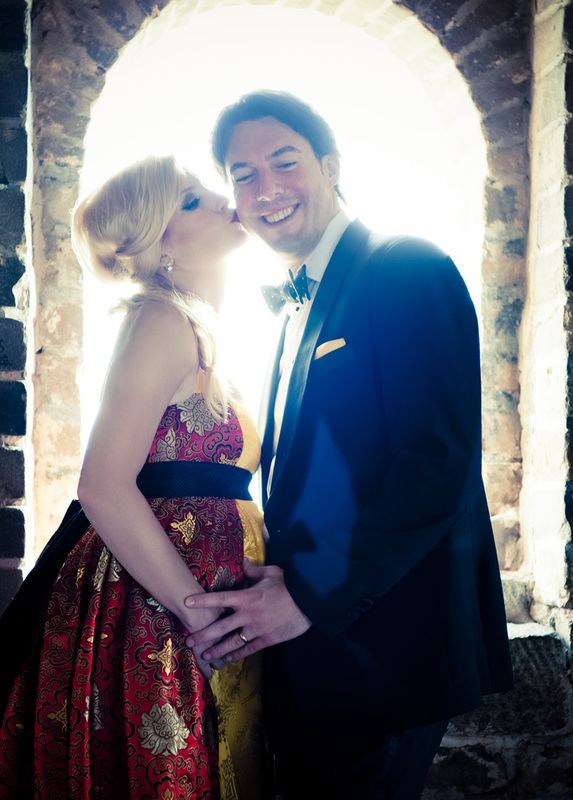 Perhaps I got a little camera happy with the happy couple…. Up, up, and away! Riding the chair lift to the top of the wall. Kara cruising down the slide. 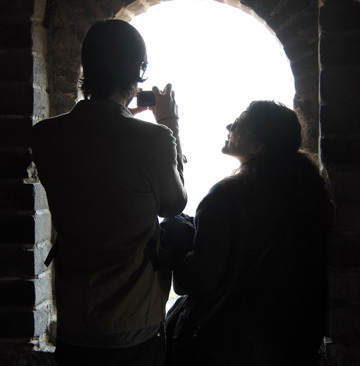 The best part of visiting the wall at Mutianyu! Quite possibly my favorite picture of the trip. 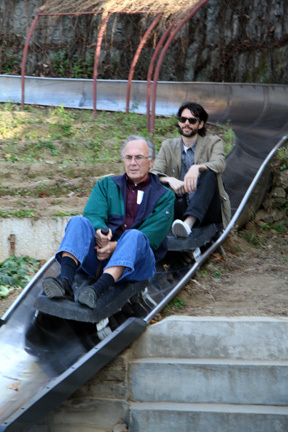 Clearly, Cory is not pleased with Tom’s choice of speed. His face is the physical definition of boredom. 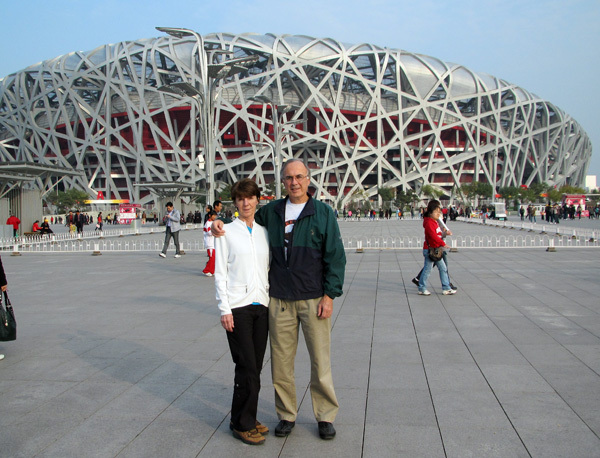 Tom and Donna in front of The Bird’s Nest. Olympic Village – Beijing. Brett finally makes it! 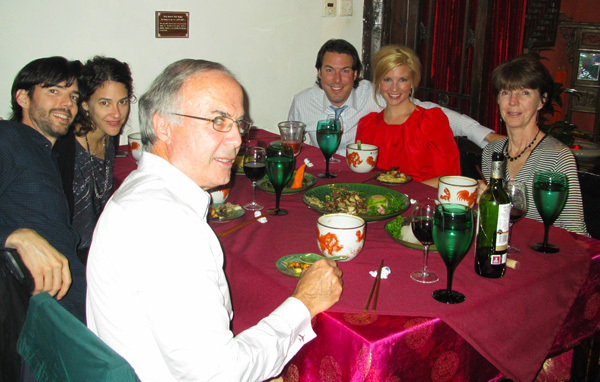 Family dinner at Mao’s Red Capital Club. This restaurant, hidden in an ancient hutong alleyway, serves tasty food – but the main reason to visit is to step back in time and soak in a bit of “Mao’s China”. 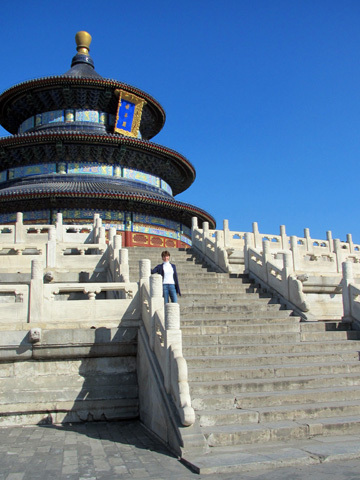 Walking into the gardens surrounding the Temple of Heaven. 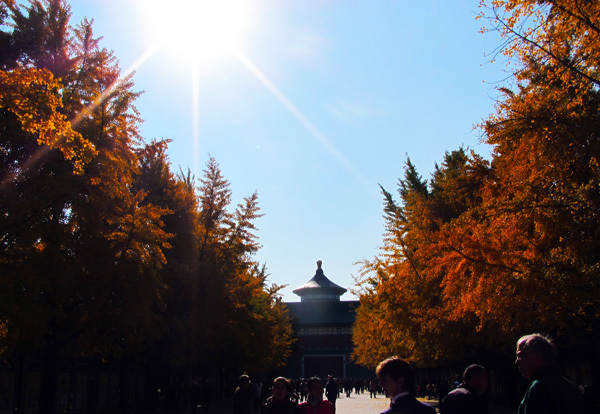 We were so lucky to have such a beautiful Beijing day. A rarity to say the least. I would say I was trying to be artistic…but perhaps Cory is just too tall! I still like it though. 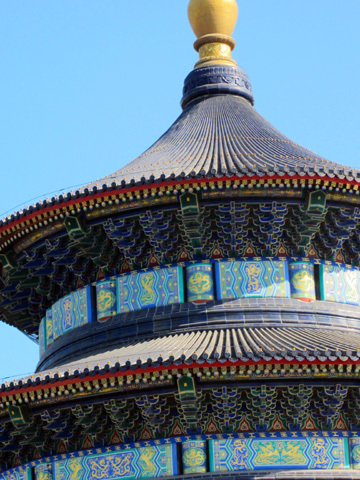 Temple of Heaven – Beijing, China. Old school online dating?? 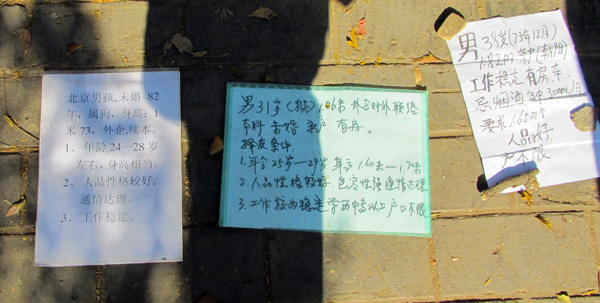 We stumbled upon a mass of middle-aged, local Chinese men and women in the gardens surrounding the Temple of Heaven with dozens of papers like these taped to the ground. After chatting with a few of them, who were actually willing to talk with me in Chinese – I was able to learn that they were all there to find mates for their children. These “papers” are actually dating profiles including personal details such as height, age, and occupation. Some even go so far as to say if they are home or car owners. Amazing! Okay…so this is obviously Cory, not Brett. 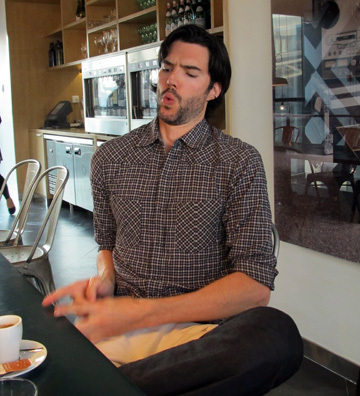 But for those of you who truly know Brett…you know that this is an impersonation of his “intense face”. Complete with the drumming of the fingers. Nice tribute, Cory. 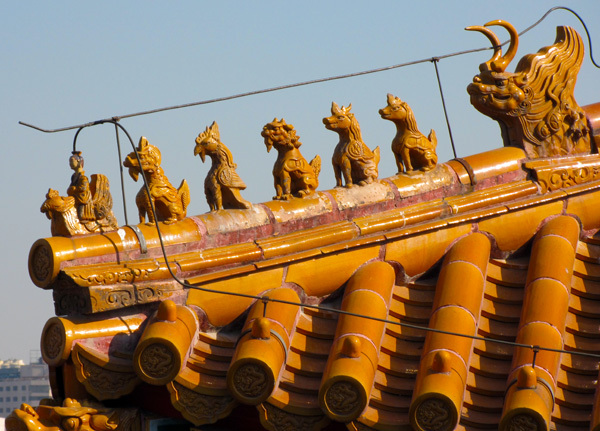 The Forbidden City – Roof Tile Detail. 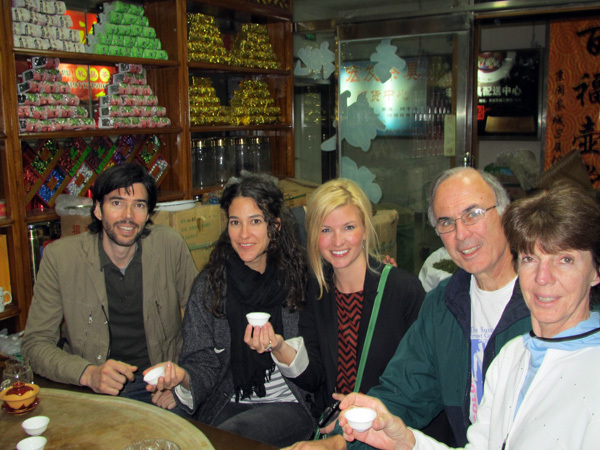 Tea Tasting on Tea Street. Somehow I didn’t snap a picture when they put Kara to work separating proper tea leaves from the bad ones…what a missed opportunity. I have a feeling that her daily wage might be more than they are used to paying. This is the coup de gras of photos from the trip. Apparently, my harassing comments to Tom about the fact that of all things to bring to Beijing, he packed his “Turkey Trot 1997” t-shirt hit a nerve. His response to my torment was to jokingly wear it under his sport coat for Brett’s birthday dinner and party at Maison Boulud. Loved it. He did change – although I think I would have preferred him like this. 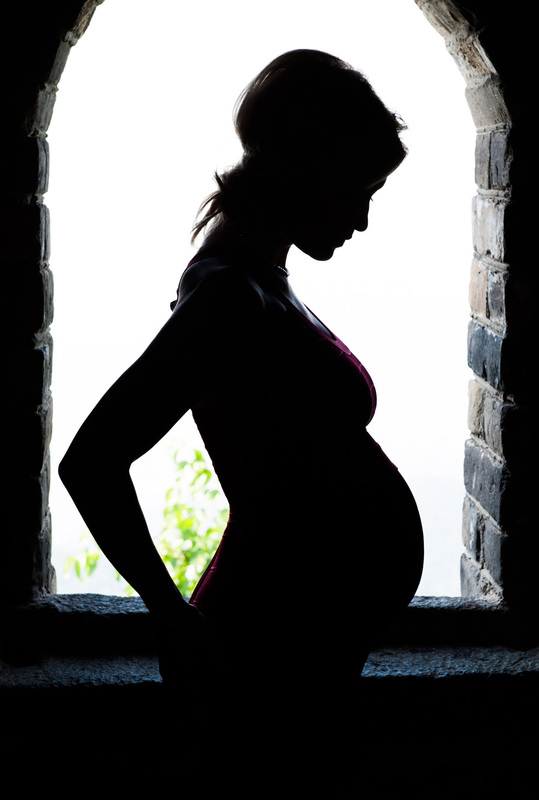 While the word itself…”babymoon” seemed to turn my husband’s stomach – he had absolutely no problem with the concept of actually taking a fabulous trip before our little munchkin arrives. Personally – I don’t care what you call it. I will take a romantic get-away with my husband any chance I get! 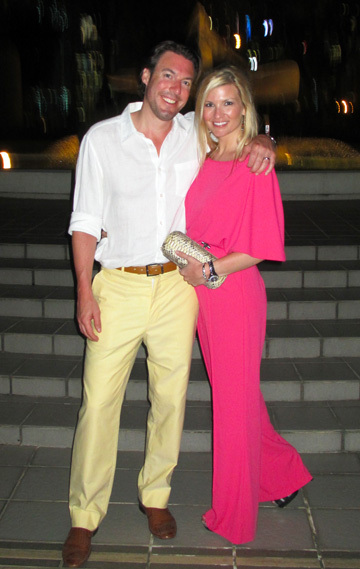 So off to the Maldives we went to celebrate the upcoming arrival of Baby Hutch. 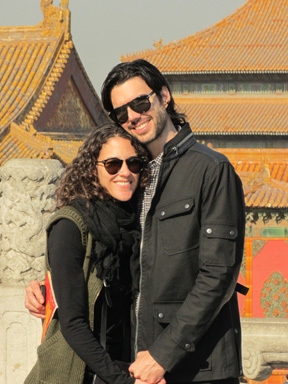 After rave reviews from my sweet friend and newlywed, Brandace Wilson, (who just returned from her honeymoon) we knew we must take advantage of the direct flight from Beijing to Malé while we still had the chance. 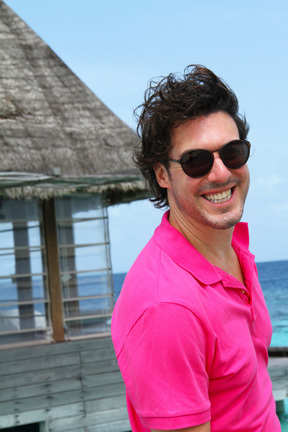 And while it was difficult to choose a resort (because they are all quite amazing) – in the end we went with the W Resort & Spa on Fesdu Island…just 1 of the 1,200 that make up this beautiful island nation situated in the middle of the Indian Ocean. On the W Jetty waiting for our seaplane take-off. The W has its own lounge full of cool drinks and tasty treats while you wait for “fins up”. 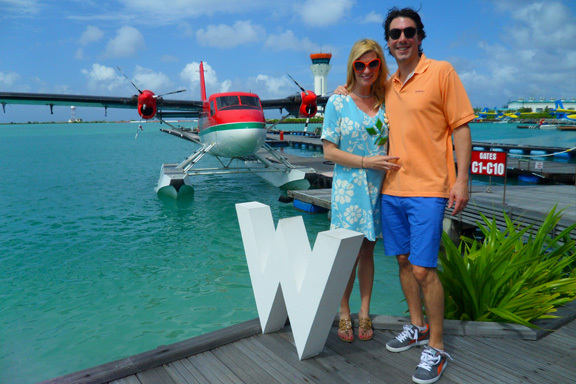 The sign of a good trip…the seaplane had my monogram. 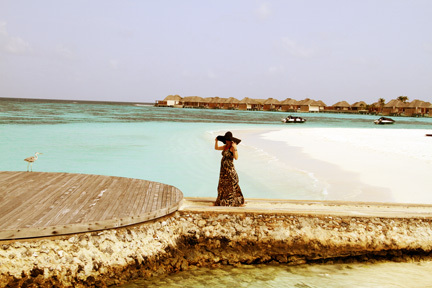 The vast majority of our time in the Maldives was spent in our own little ocean oasis. When your “hut” has everything you need including direct ocean access, a plunge pool, a well stocked snack station and minibar, and the best in-room service…why leave? So – we basically didn’t. Except for breakfast. This preggers couldn’t resist the delicious spread of the buffet and the “fruit man” who created custom fruit plate masterpieces to suit one’s individual tastes. 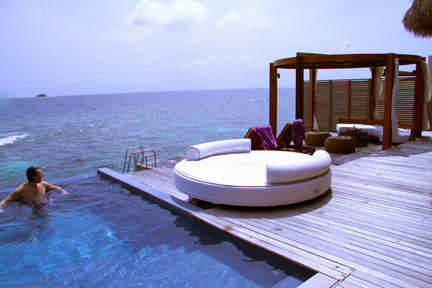 Outdoor space on our Ocean Oasis. The W also offers beautiful beach bungalows – but I think the over-the-water option (with glass bottom floors inside) is the more interesting and fun of the two. 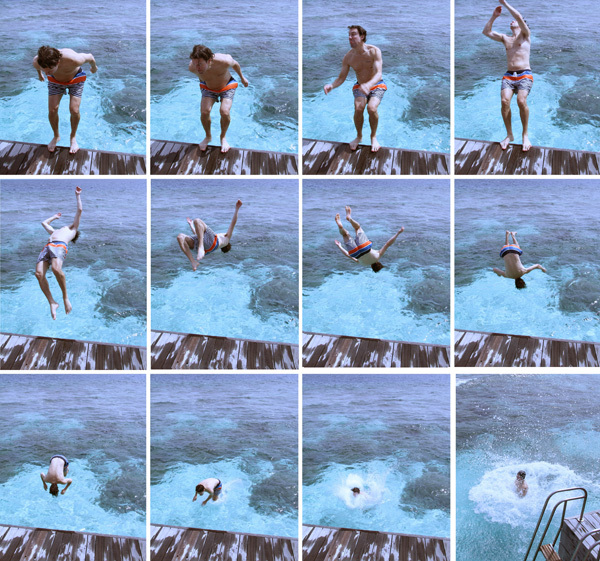 Brett’s backflip into the ocean off the deck. Reminding me that I was truly not cut out to be a “boy-mom”! In-Water Dining! Even if it is a bit warm outside…the W makes sure that your feet are cool by allowing you to give them a dip while enjoying your morning meal. One perk of traveling to a Muslim country while pregnant…the “mocktail” list is almost as long as the “cocktail” list! 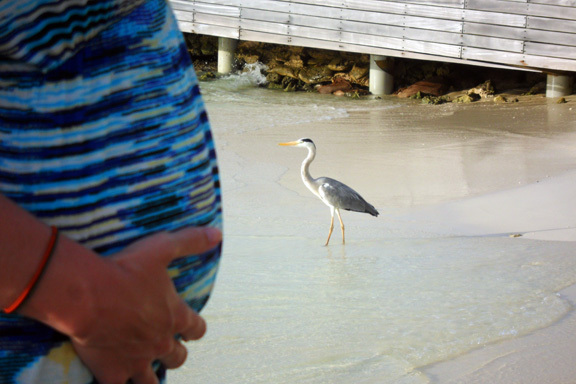 The bird and the bump! 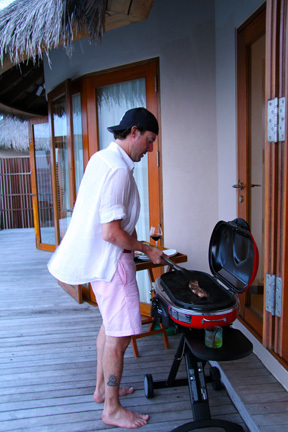 One night we decided to take advantage of the W’s In-Room BBQ Service. They provide all the “fixings” and you can choose between American or Asian style. Clearly, with the current lack of American BBQ in our lives …we opted for the potato salad and grilled corn-on-the-cob option. All that was left for us to do (after they delivered the spread and set-up the grill for us) was to actually throw the meat (ribs, burgers, and wings) on the grill and eat it! Great food. Great view. Extra great company. 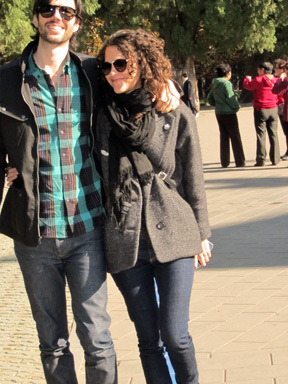 This couple wore matching outfits everyday. 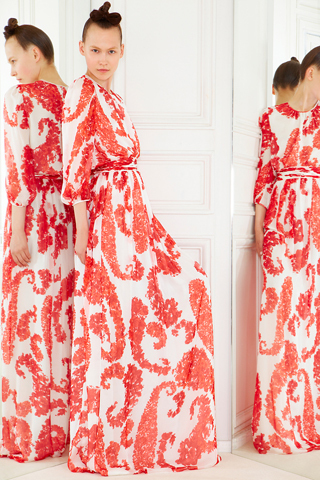 Not your typical “trousseau” to say the least! Although we only caught a quick glimpse of their husbands, these ladies went all out for a not-so-impromptu photo shoot around the tiny island wearing formal gowns. We see this constantly in the Mainland! 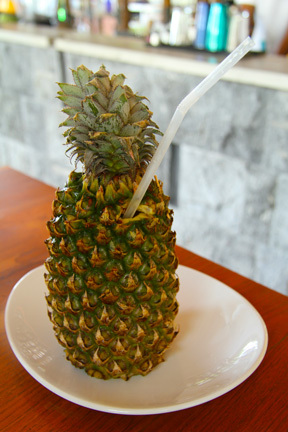 On our last day at the resort, before heading back to Malé for a quick tour of the world’s smallest capital city and then back to Beijing, we decided to allow ourselves the ultimate cliché in destination drinking…Pina Coladas! (A virgin one for me of course!) 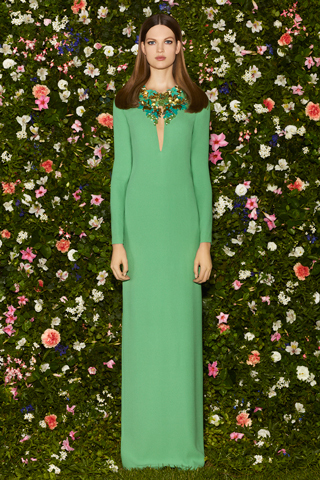 But who could resist this packaging?? 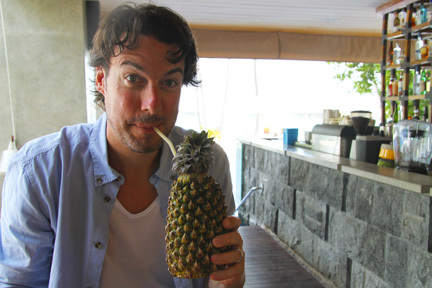 Puckering up for his Pineapple! His was much better than mine…I did have a tiny sip! Until next time beautiful blue water and soft silky sand! A parting message in honor of our little beach-bun-in-the-oven! 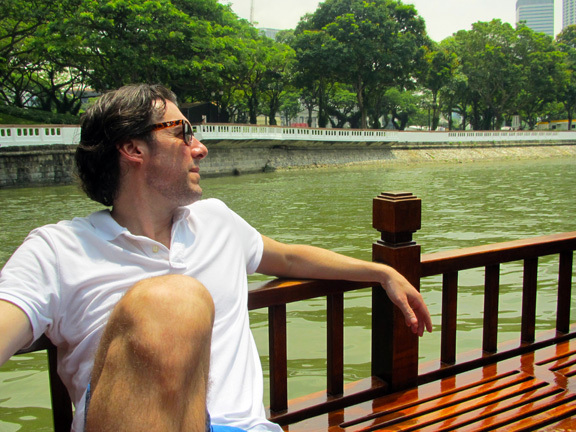 On a whim, Brett and I decided to take a last-minute trip to Singapore during the Chinese May Day Holiday. After almost 3 years of hearing numerous friends tell us of its greatness, we thought we should see it for ourselves. I am so pleased that we did. It truly is a great little country. 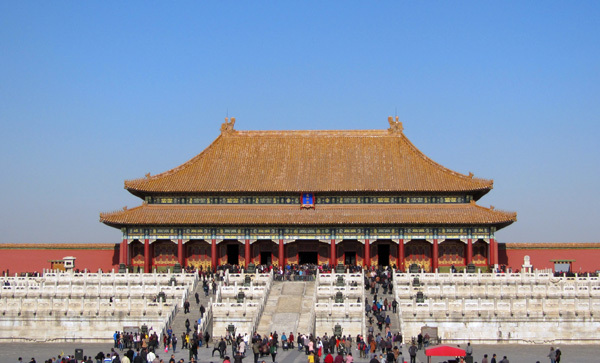 Several airlines offer non-stop flights from Beijing, but Jet Star (a division of Qantas) offered the best red-eye option, and as an additional bonus – they were running an online special for business class fares. 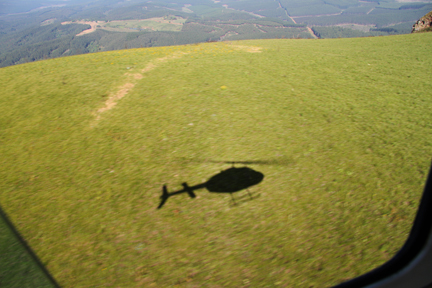 It’s no Emirates – but the flights were on time, the service was friendly, and we arrived safely. We landed in Singapore at 8:30 AM with an entire sunshine filled day ahead of us. So – our natural first stop (while waiting for our noon check-in) was the hotel pool. Beijing hasn’t quite grasped the concept of an outdoor hotel pool – so we are starved for the smell of chlorine, cucumber infused water, and cool hand towels smelling of eucalyptus. A morning of vitamin D (not from a bottle) and lunch al fresco was just what the doctor ordered. There are many lovely hotel pools in Singapore that offer beautiful views of the city and the bay including classics like The Fullerton, as well as stunning newcomers like the Sands, but after doing a bit of research – the rooms at the Mandarin Oriental pushed me over the edge. 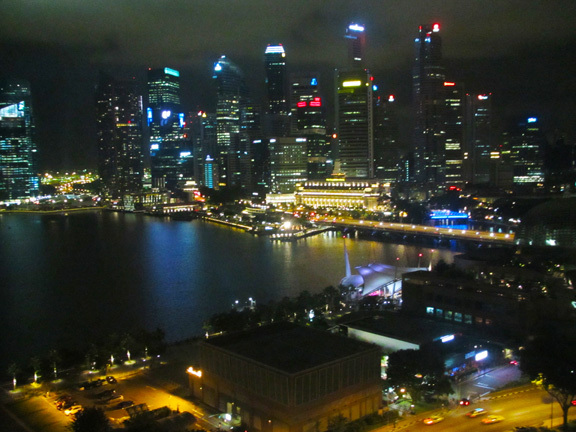 Also – The Fullerton Hotel and The Sands are tourist attractions in and of themselves. Fun to visit for a cocktail or afternoon tea, but the crowds could be a bit much at times if you were staying there. The picture below shows our view of The Sands Hotel from our room. The entire 57th floor is an outdoor observation deck complete with 2 restaurants, a lounge, and a magnificent pool surrounded by palms. The ground floor and basement levels house the casino which now also houses some of our money! While lucky in love…not so lucky at the blackjack table. The Sands Singapore. 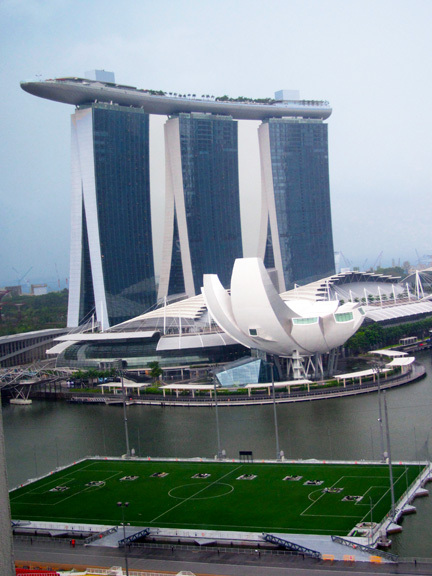 The white structure in front, resembling the bottom part of an artichoke is the Art & Science Museum of Singapore. To its immediate right (unfortunately not in this picture) is the floating Louis Vuitton store – that’s right, it is on the water. That soccer field is floating too! For first time visitors (like us), I strongly suggest staying around the harbor. The views are spectacular and taxis can easily and quickly take you to other parts of the city…like Orchard Street for shopping! 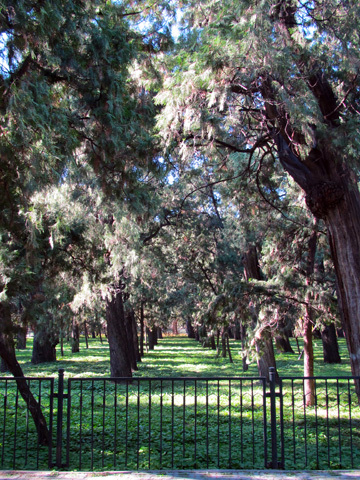 That said, you will find plenty to do around the bay – all within walking distance. Or, you can take a water taxi, which is fun. 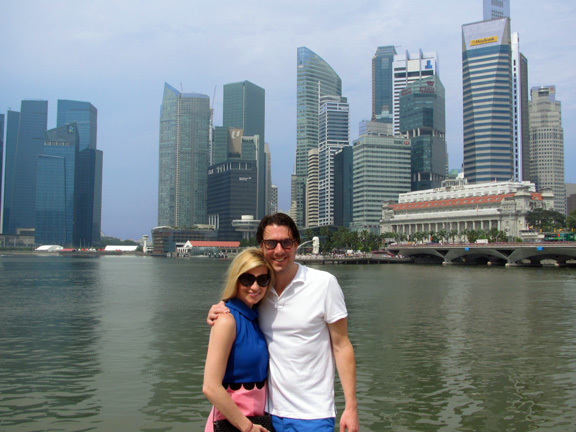 We decided to take a little cruise on the water to see the Singapore sights. It really is a charming city with colorful outdoor cafés lining the banks of the river. Beautiful and intricate foot and motor bridges are found at each turn and old, deep south looking trees with roots the size of humans flank either side. Along our journey we saw many historic buildings and heard the brief history of the city’s development. There are a couple different companies that offer these hour-long trips (around $20USD per person). 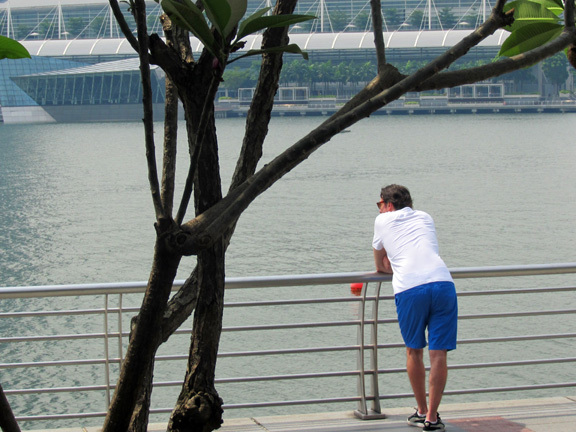 We chose the Singapore River Cruise Company – but they all appear to be about the same. It was a great, easy way to learn about the city. But be sure to apply sunscreen before setting sail…my pearly white, hadn’t seen the sun in months skin (thanks to BJ’s not so friendly skies) was fried by the end of our short cruise. 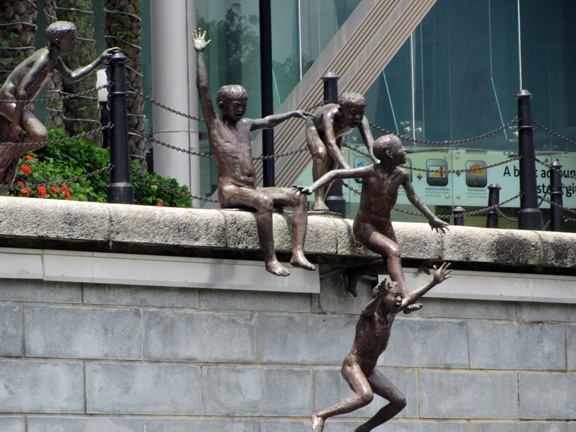 This set of bronze sculptures captures the joy of little children, who years before Singapore’s commercialization escaped the heat by leaping into the cool river. 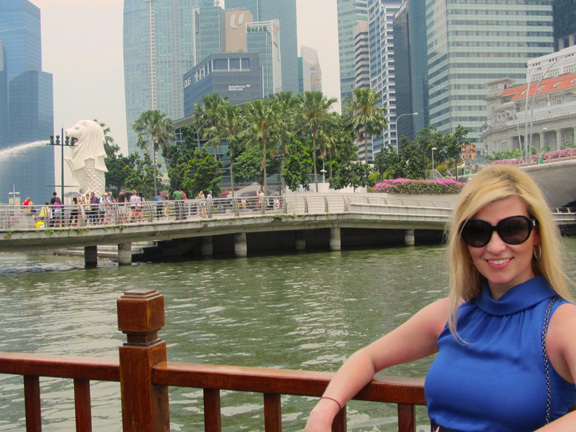 On the river cruise admiring Singapore’s famous MerLion (half-fish, half-lion). Over 1 million tourists come to see her and her cub (which is currently under renovation) every year. 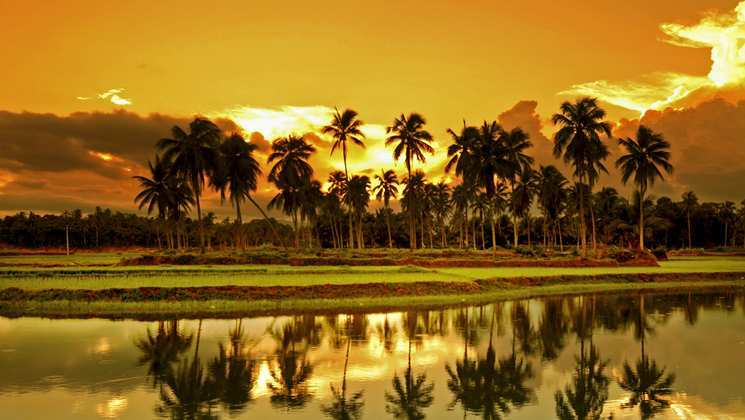 While there seems to be an endless amount of things to see and do in Singapore – theater, music, breathtaking golf courses, lush parks filled with colorful blooms, etc. 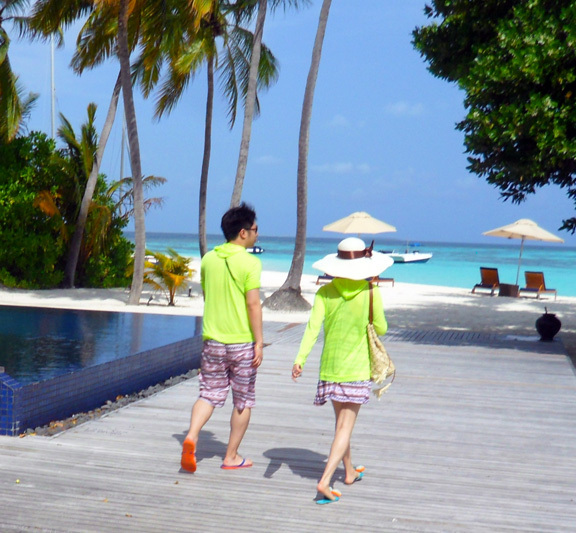 – we opted for a more leisurely stay with loads of pool time and delicious cuisine. In the picture below – we are winding down on our last night with very happy (and VERY full) bellies after having eaten at Cut, Wolfgang’s amazing steak house. Excuse my ignorance – but I had no idea that Guy Savoy, Mario Batali, Wolfgang Puck, Daniel Boulud, and countless other top chefs all have outposts here! Well played Singapore. Thank you Singapore for such a rejuvenating long weekend. I am very much looking forward to our return! Cue the music because — We are COMING TO AMERICA! The city that never sleeps to be specific. Farewell Beijing (well…for 10 days or so). 9. Window shopping (the concept really doesn’t exist over here – unless you consider getting mobbed every 5 seconds with relentless offers such as, “Hey lady, I give you good price!” to be the same as cruising in Nolita or up Madison Ave). Personally – I do not. Although…don’t get me wrong, I do love to bargain at the markets…but you just can’t beat strolling the city streets in the fresh spring air. 10. Happy Hour at the Carlyle – Bemelmans Bar to be exact. Our special spot! 11. Duane Reade…I am allotting at least a 2-hour window to peruse their glorious shelves. The Easter candy and card aisles alone will keep me entertained for quite a while. 12. Weekend get-away to the Hampton’s – it will still be chilly…but seeing the ocean and snuggling by the fire with my husband is a MUST! AND…too many other wonderful things to mention! 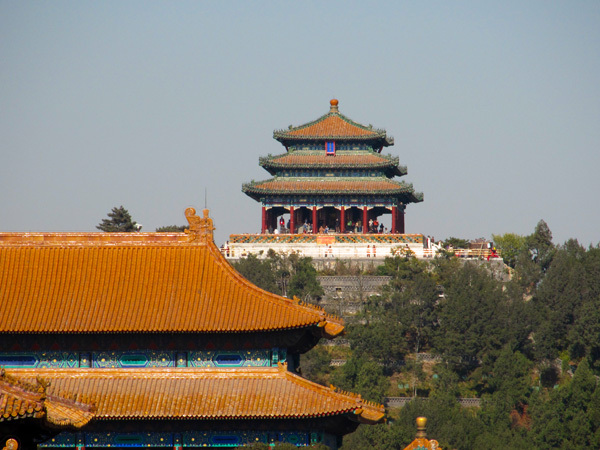 My big Beijing blues – they are melting away…. It’s up to you – New York…New York! 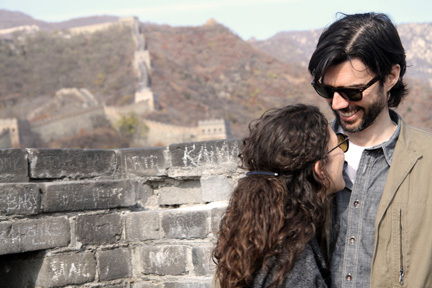 Just as I sit here in our apartment, looking out onto the pollution filled Beijing skyline – I am supposed to be sitting next to my marvelous man with a glass of something sparkling in hand, aboard a plane bound for Sanya. Specifically, Haitang Bay. Specifically, see below. 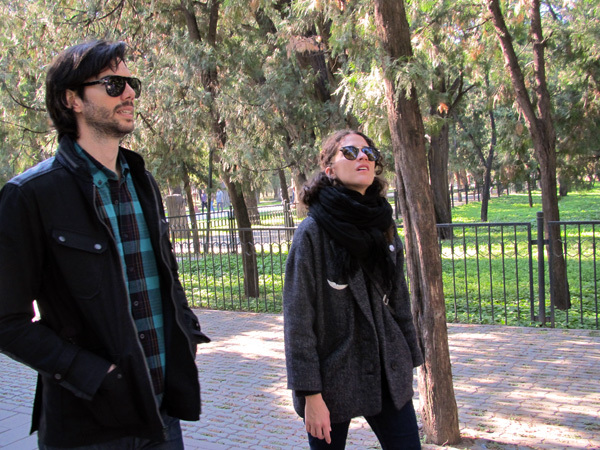 But as it has a way of doing from time to time…life got in our way. So, I decided to distract myself (from the cold…the smog…and our annoying neighbors’ cigarette smoke that permeates the hallway and seeps under our door – sorry for the bitterness of this beach deprived blonde) by writing about glory days of beaches past. 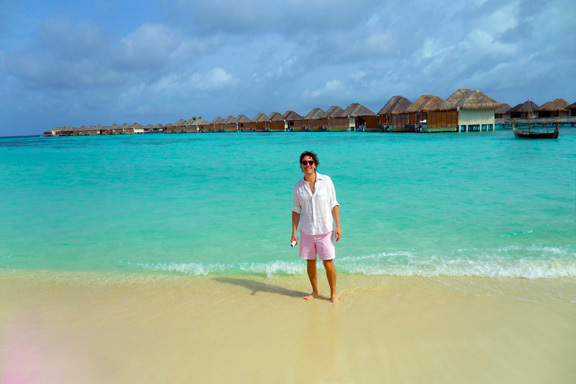 So onto to something much more marvelous…like Mozambique! 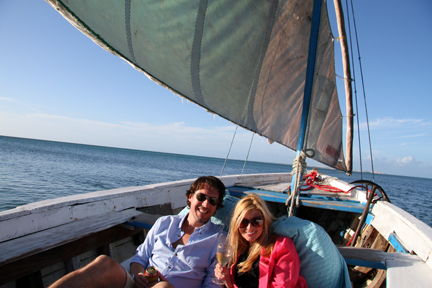 The Bazaruto Archipelago of Mozambique was the perfect way to end our 3 week stay in Africa. It was all sand, sailing, seafood, and fun in the sun. Even my third degree burns (see: A Burnt Bride) couldn’t put a damper on this to-die-for island. 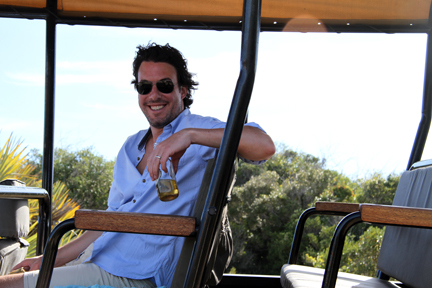 Brett enjoying a local brew while taking in the sites of the island via an open air jeep. 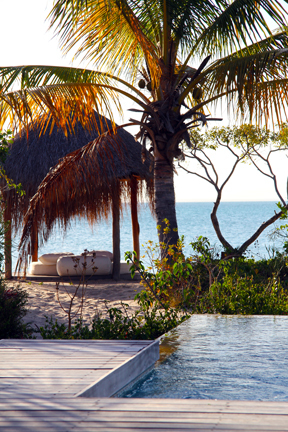 TRAVEL TIP: For other South Africa bound honeymooners…there are many travel companies that will push the Seychelles for “end of the trip beach time” – BUT the islands of Mozambique will provide all the luxury with half the cost. Although…that will probably change as their popularity grows – so book fast! 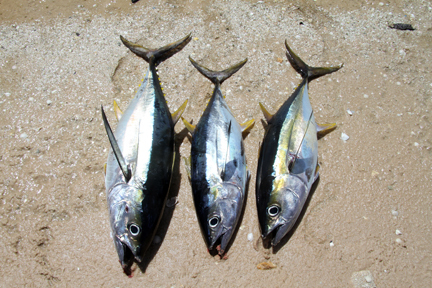 Our Catch of the Day! 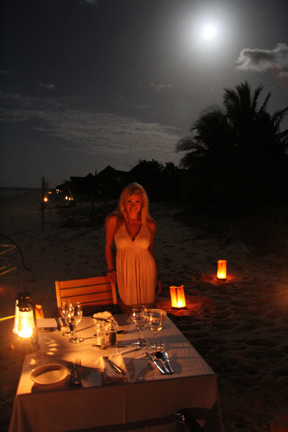 Enjoying our catch of the day by candlelight at a romantic table for two on the private beach. Perfection. 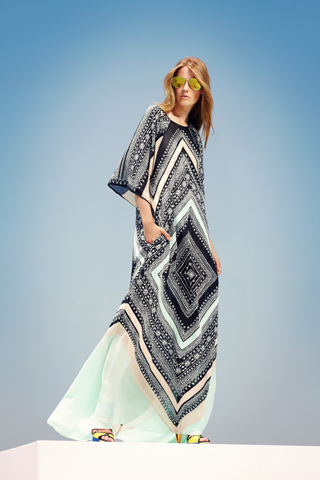 On a positive note…we are in the process of rescheduling our beach time trip. 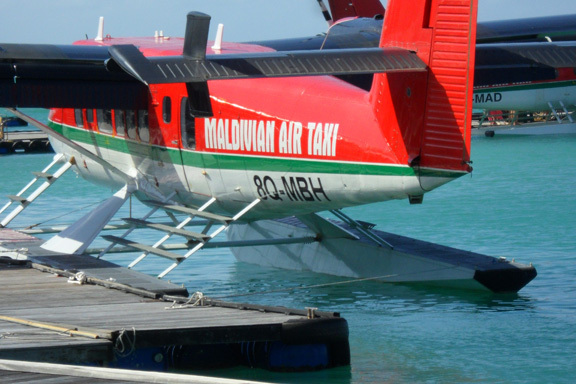 For now – the departure date is set for two weeks with an alternative destination: The Maldives (thanks to the recent non-stop flight offered by Mega Maldives Airlines). Fingers crossed. As it always does…time has slipped through my fingers once again. 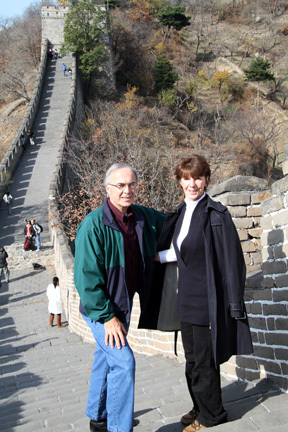 Not only have I not posted anything in regards to China lately, I haven’t posted – well…anything at all! So, I thought I would step back in time for a moment and finish sharing the tales our adventures in Africa this past October. 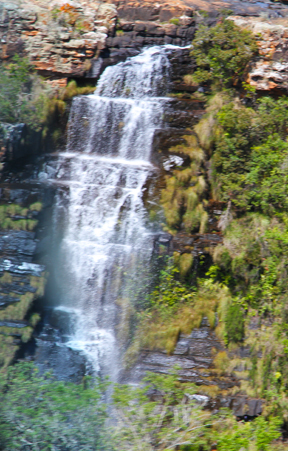 It was brought to my attention that I never wrote about the Blyde River Canyon or Mozambique. Two places that definitely deserve recognition (and high praise…Nick Cage style). 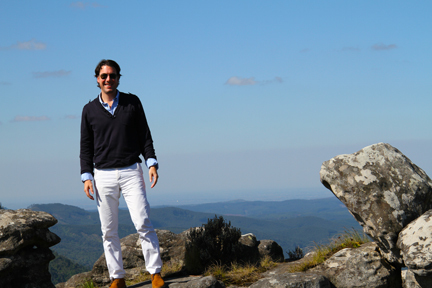 From Camp Jabulani (where I left off…see the following link for details: https://ablondeinbeijing.com/2011/12/27/its-all-about-the-elephants/) we traveled to the Cybele Forest Lodge and Spa – a Relais & Chateaux property nestled in the woods of northern South Africa. The lodge is perched 3,000-feet above sea level amidst Mpumalanga’s forests, mountains and meadows between White River and Hazyview. Owners Rupert and Barbara Jeffries have transformed the original hunting lodge they bought in 1979 to a cosy, yet stylish retreat. 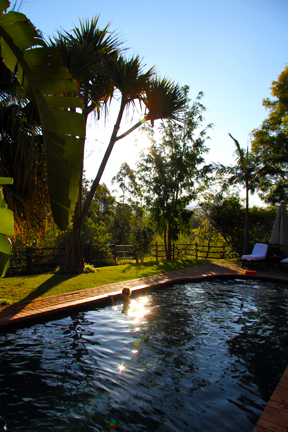 There are twelve quaint cottages and ours had the added advantage of our own heated swimming pool! It was divine! 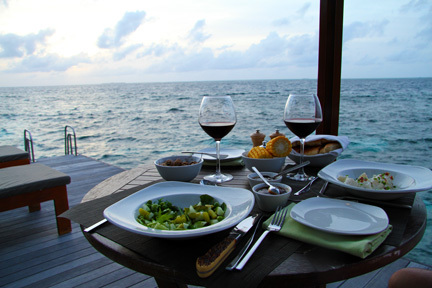 During our two nights stay, we took all of our meals in our room at the dining table or poolside on the patio. It was the ultimate in privacy. We did leave the room…twice. 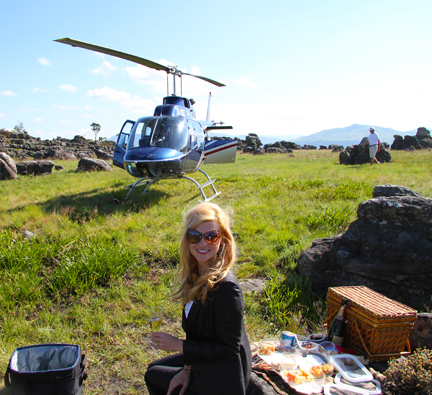 Once for a couple’s massage and once for a helicopter ride through the canyon, complete with a stop at God’s Window for a champagne picnic. Needless to say, it was a very strenuous 48 hours. 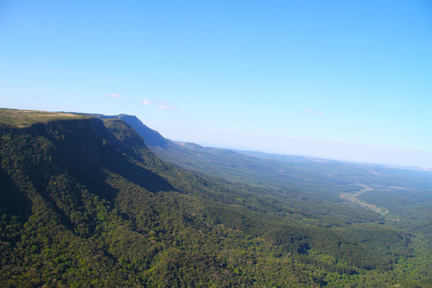 I honestly had never heard of the Blyde River Canyon (the 3rd largest in the world – not to mention that it is a GREEN canyon) until we began our research for the trip. I am so glad that we made the decision to venture off the beat and path to see this side of South Africa. It was completely unexpected, and is mostly highly recommended. I don’t think it is possible to truly capture the beauty of this magical place with unprofessional photographer hands (like ours), but I hope that our pictures capture enough of its essence to encourage you to visit. 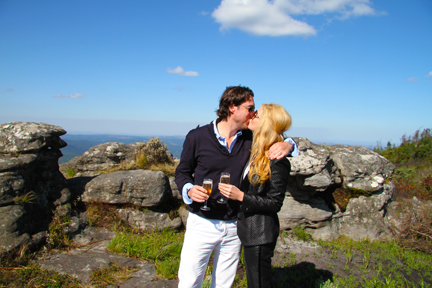 Thank you Cybele Forest Lodge & Spa for such a rejuvenating stay! Just writing and remembering has relaxed me…and well, distracted me from the hazardous pollution of Beijing. Literally. The “pollution-o-meter” recommends staying in today. So – Blyde Blogging it is! 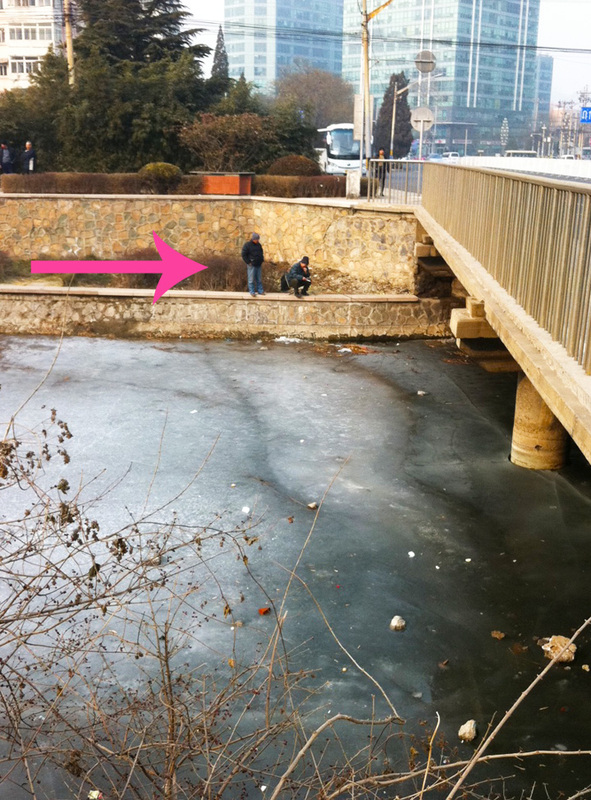 Only in China can you find two men “ice fishing”, on a Wednesday afternoon in below freezing temperatures from a shallow, trash-filled stream in the middle of Beijing. With cold fingers and a red nose, I watched them for quite some time. 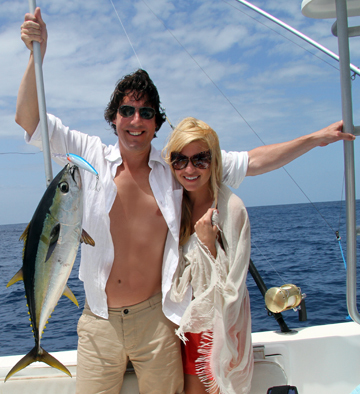 Unfortunately – but not surprising at all…there was no catch of the day! Love the dedication, Zhong Guo Nan Ren! 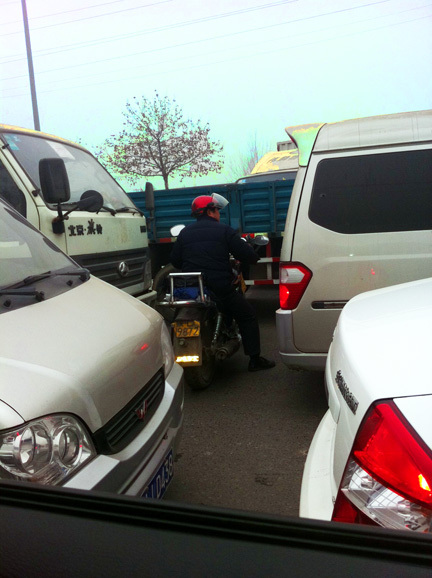 While it was certainly not the first “JAM” I have spotted in China, it was one of the more intense. It is also Reason Number 486: Why I will not be driving a motor bike anytime soon. Reasons 1 through 485….I am a terrible driver. Period. Meili Autumn: Make-up Artist Extraordinaire!